Students are petitioning to change the LSU football mascot from a Tiger, claiming that it symbolizes racism. For years, the LSU football team has rallied around a mascot that roams the sidelines on game days. Well, that may no longer be the case if a handful of LSU students have their way. You might be wondering how a Tiger mascot could be construed as a racist symbol of white oppression, but the petition explains it in depth. 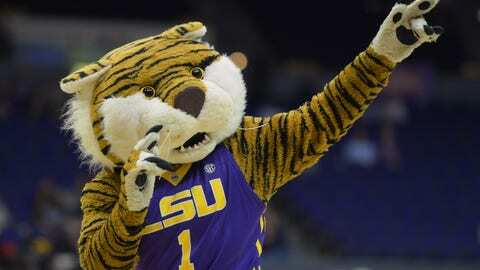 Louisiana State University named their mascot the Tigers, and they named it during the height of Jim Crow South. This was a time when black men feared for their lives, and were treated as sub human. This symbol is the most prevalent confederate symbol in the United States. These powerful white males choose the Tiger as a symbol to honor a confederate regiment called Louisiana’s Tigers. They were known for their propensity for violence on and off the battle field. They were just as violent to the black slaves they owned, and later even more violent once those slaves were set free. While it might be tough for everyone to grasp the alleged racism, there are currently 568 supporters of the petition. Moreover, although you may disagree with the petition, it’s an American right to fight for what you believe in. Like it or not, this is what comes with freedom. You don’t have to agree with everyone’s opinion, but you should respect that they are putting up a fight for what they believe in. No, this probably won’t sit well with most LSU fans, but it at least prompts a discussion and is worth taking a closer look at. What do you think of the petition to change the mascot due to alleged racist overtones? The petition is picking up steam, but it will take a lot for the university to make the switch from the mascot which has been with the school for decades.